When our monitoring center receives an alarm signal a powerful chain of events takes place. First, we contact the premises where the alarm is sounding, to try to gather more information, stop a false alarm, or schedule a repair visit for any equipment problem. All phone exchanges are verified by unique pass code to insure authenticity. Our quick call-back response helps reduces your chance of false alarm fines from local authorities. If we cannot get someone to provide proper pass code and/or alarm shut off, we notify local authorities (police or fire, depending on the situation). Next, we call your emergency personnel; these are people you have designated us to call. We will continue updating local authorities with any new signals we receive. 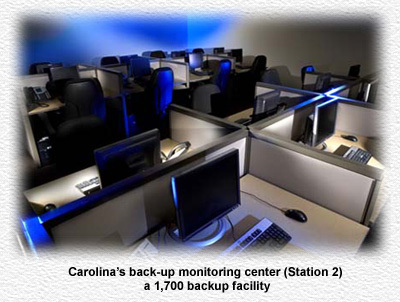 Within seconds of the dispatcher notifying authorities, a computer report is also compiled and sent over to Carolina Command Center where your alarm incident will be reviewed by a supervisor and compared to any previous alarm history. This allows us to personally spot trouble situations and fix them, sometimes even before our customers realized there is one. This unique, individual attention is just one example of our commitment to our customers' security, and the way Carolina is bringing personal service and customer care back to the alarm industry. Carolina: giving customers more than they pay for. When you choose Carolina Security & Wiring you have taken your security seriously. Our monitoring center consists of a team of 53 dispatch and support personnel, providing you the highest quality monitoring service possible. 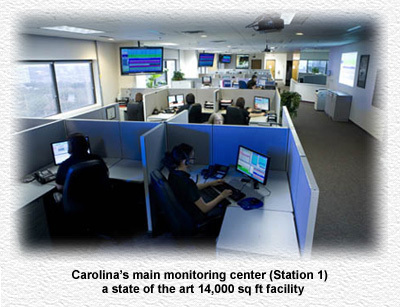 Operating in a state-of-the-art facility, our monitoring center is U.L. Listed and has backup power supplies provided by rechargeable batteries banks and natural gas generators. In addition, our monitoring center has the highest security in telephone connectivity possible. Consisting of an OC3 150mb connection, this telephone throughput is 100% fiber optic and equivalent to the connection of 100 T-1 lines. Additional loop protection is provided which connects our monitoring center to two different central offices, for off-site redundancy. Even complete, catastrophic failure of one central office cannot disrupt your service. All day, every day, Carolina Security is there to protect you.